From the looks of it the Pit Barrel Cooker (PBC) is just another Ugly Drum Smoker (UDS), and whilst that’s right, it’s also very wrong. Homemade ugly drum smokers have been around for ages and have provided a way for anybody to create a decent smoker inexpensively and easily. 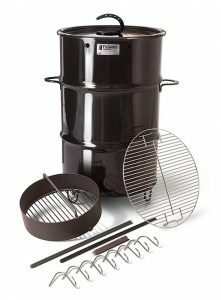 But now the Pit Barrel Cooker has taken that idea and refined it into one of the best charcoal smokers available today. 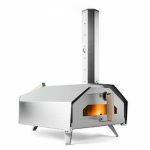 The PBC is like a convection oven, it provides a consistent heat throughout the drum which makes it ideal for hanging meat. 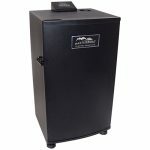 For the low price of the Pit Barrel Cooker it has quickly become one the most popular beginner smokers around and can produce incredibly tasty, succulent meat with next to no hassle. 1.1 What’s Included with the Pit Barrel Cooker? 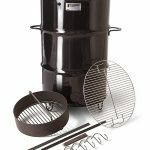 What’s Included with the Pit Barrel Cooker? 1 – 30 Gallon (136 litres) Porcelain Coated Steel Drum. 8 – Stainless Steel Hooks. 2 – Steel Hanging Rods. 1 – Wooden Hook Remover. 1 – 3 Point Barrel stand. As you may have noticed, there is no need for a water pan. This is because there is only one air intake at the bottom and no exhaust vent at the top. This means that moisture builds up naturally on the inside of the barrel from the meat which only adds to the taste. 36 inches (91.5 cm) tall and 25 inches (63.5 cm) wide, including the side handles. The grill grate has a diameter of 17.5 inches (44.5 cm). The hanging hooks are about 4 inches (10 cm) long. The distance from the hanging rod to the top of the charcoal is roughly 22 inches (56 cm). Most of the Pit Barrel Cooker is made up of the 30 gallon porcelain steel drum. It’s made of 18-gauge steel that is coated with porcelain enamel for added strength and durability. Even when ours got a bit hotter than recommended it managed to withstand the heat just fine. The lid is made of the same material as the drum and is just as durable. The handles are made of horseshoes which is a nice visual touch although they can get very hot so some gloves are recommended. The size is the standout point here, with a capacity this high you can fit up to 8 slabs of ribs. The stainless-steel hooks and the steel rods are just as you’d expect. They are solid steel so hold up to the heat very well and have rustic, authentic aesthetics that match the rest of the PBC. The whole design allows for no water pan and instead allows the meat the cook in the smoke of its own juices, which we think really does add to the taste. 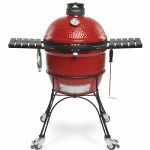 The charcoal basket and grill grate are also just as you’d expect, nothing exceptional in the design or quality but they do their jobs just fine. 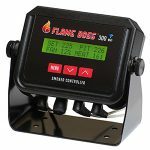 The PBC is also usable in winter and will perform well at temperature as low as -15°F. If you’re up for the cold it is recommended that the lid be left ¾ of an inch off for roughly 25 minutes at these low temperatures to ensure enough heat. Also storing you Pit Barrel Cooker is important and we recommend using a Pit Barrel Cooker cover from UNICOOK. Overall the build quality is pretty great for the price of the Pit Barrel Cooker. There isn’t anything exceptional but it’s all durable enough to withstand a lot of heat, it produces some delicious, tender meat and it sticks to the simple design of the UDS that has become somewhat iconic. So we can’t really fault it. 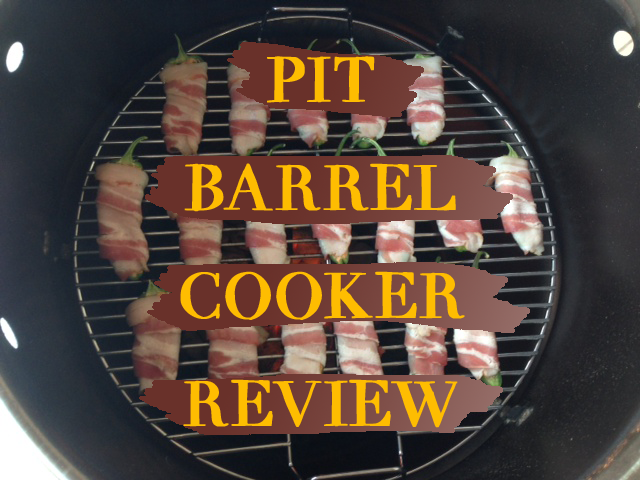 Undoubtedly the best part of the Pit Barrel Cooker is the fact that anyone can use it. You need next to no experience in smoking or even cooking to consistently create fantastically tender and incredibly tasty meat. 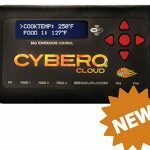 This is truly one of the best smokers for beginners and most veterans will be happy with the ease of use as well. Included is a small wooden hook remover that makes taking the hooks off the rods much easier, this is a nice attention to detail and just sweetens the deal. That’s pretty much it, once it’s lit, put your food on the grill or the hooks and leave it for a few hours to cook. 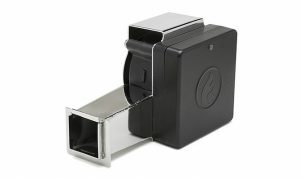 There is an airflow regulator at the bottom of the barrel that is used only at different altitudes. This should not be used to allow more air in or as a standard airflow regulator. Let the PBC do what it was designed to do. 0-2000 ft the vent should be roughly ¼ of the way open. 2000-5000 ft the vent should be roughly ½ of the way open. 5000-8000 ft the vent should be roughly ¾ of the way open. At 8000+ ft the vent should be fully open. There is also cleaning to take into account, and this is another fairly strong point of the Pit Barrel Cooker. It’s very easy to empty the ashes, you simple turn it upside down. If you’re looking for a more elegant way of disposing of the ashes then there is an attachable ash pan made just for this. The simplicity and ease of use is like nothing else we’ve tried, it’s a true ‘set it and forget it’ cooker. This makes it easily one of the best beginner smokers available today. The Pit Barrel Cooker comes fully assembled, all you have to do is add the coals and either the rods or the grate. It’s as easy as that! Good build quality – the simple design and quality materials lead to a very sturdy and durable cooker. Portability – The PCB is surprisingly portable. Once you’re ready to head out you can just pick it up and go. It’s relatively light weight for its size and durable enough to be taken anywhere. The manufacturers strongly recommend using only one type of charcoal – Kingsford Briquets. This means that you will be slightly restricted to how you use the Pit Barrel Cooker and the taste of the final meat. We have used other charcoal and even wood and have had no problems but if you want to stay on the safe side then stick to what the manufacturers recommend. Having to use specific charcoal highlights a flaw with the Pit Barrel Cooker. 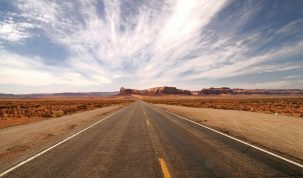 You have very little control over the temperature if you choose to use anything but the recommended fuel. 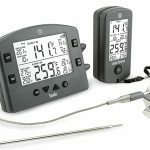 However you end up using it we recommend having a wireless thermometer on hand to try and keep the temperature around 300°F (roughly 150°C) for general cooking. 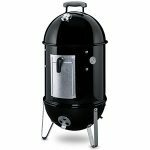 For anyone that is new to smoking the Pit Barrel Cooker is one of the best options available. It’s durable, easy to use, portable and really good value for money. 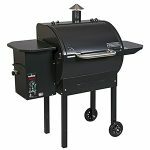 It makes a good option for anyone looking for a grill and a great option for anyone looking for a smoker. The fact that you get both in one at such a low cost with no set up required makes this almost a no brainer. There is next to no customisation though and it is said by the manufacturers that, despite it looking like a standard UDS, this is a complete product and should not be tampered with. If you’d like to mix things up a bit and grill whilst smoking, there is a half and half grill grate that allows just this, but that is about the extent of the customisation you’ll get. Pit Barrel Cooker have a great FAQ on their website that will cover any problems you might face. They also have a great YouTube channel full of interesting tips and tricks and recipes. We have a list of recommended books to get you going and generally increase your knowledge of BBQ and generally cooking outside. 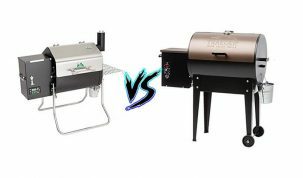 The Pit Barrel Cooker also managed to make it onto our list of best offset smokers, despite technically not being an offset smoker, in addition to our best charcoal smokers under $300. People keep saying that the PBC is a great smoker/cooker grill for BEGINNERS! Over many years I have used just about every type of quality smoker (except the pellet poopers), and, have found that the PBC, if used correctly, can produce great BBQ right out of the box. No water pan, no temp. gauge, one air vent, and most of all, no aggravation. As close to “set it and forget it” as you can get, while imparting a true charcoal/wood flavor to any meat. If I had this thing 40 years ago, it would have saved me a lot of money, time, and again- aggravation. 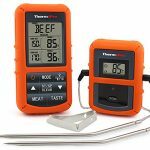 Have been smoking a wide range of food for over 15 years and I would agree – the PBC is not just for beginners! it works well as a “set it and forget it” option but if you want to dial it in you can easily do so with a good wireless thermometer with two probes (one for the meat and one for the barrel) and cracking the lid open slightly when needed.